. يقدم Burleigh On The Beach خدمات لا غبار عليها وكل أشكال اللياقة وحسن الضيافة اللازمة لإسعاد ضيوفه. يقدم الفندق فرصة للاستمتاع بشريحة واسعة من الخدمات بما فيها: تسجيل دخول/خروج سريع, تخزين الأمتعة, ركن للسيارات, التوصيل من وإلى المطار, رعاية أطفال . بالإضافة لهذا,تتضمن كل غرف الضيوف مجموعة واسعة من وسائل الراحة . بعض الغرف توفر حتى تلفزيون بشاشة مسطحة, حوض الاسترخاء, غرف لغير المدخنين, مكيف هواء, شرفة/ تراس لإرضاء أكثر الضيوف تطلباً. صممت خدمات الاستجمام في الفندق والتي تتضمن حوض الاستحمام, مركز للياقة البدنية, ساونا, مسار جولف - ضمن 3 كم, حمام سباحة خارجي لمساعدتك على الاسترخاء والراحة. استمتع بخدمات لا يعلى عليها وعنوان ذو اعتبار في Burleigh On The Beach . Friendly front of house, clean rooms, spacious, double glazing to cut out noise, very good bathroom, so happy with facility. Burleigh On The Beach is fantastic. The location is great, the apartment was extremely clean. Free wifi and most of all. Very friendly on-site managers that go out of there way to make sure you enjoy your stay. Very friendly. Great managers. Very safe and secure building. Had a wonderful stay at Burleigh On The Beach! Amazing location - easy access to the beach, a quick walk to the main shops and restaurants, and incredible breakfast/lunch and dinner right across the road. Easy transit just up the road to get to Surfer's Paradise or Pacific Fair shopping. Beautiful pool and facilities and incredibly nice staff! Can't recommend enough - had a perfect stay. Thanks very much! Less than 1 minuet to the beach. Got all equipment (air con in dining room, ceiling fan in bedroom, washing machine, full kitchen). 15 mins walk to coles and other shops, free undercover parking. Friendly staff! It is just along the commonwealth game marathon route! Wonderful environment and location. Very friendly host. Spacious 2-bedroom. Our family had a lovely time!! Clean, well equipped unit in a great location. Excellent management where nothing is too much trouble, Lynne goes the extra mile to make sure that everything is OK. Would certainly recommend. Hats off to the managers and staff. The property is spotlessly clean and Lyn went the extra mile for us. The beach is a stones throw away. Cafes and shops a 5 minute stroll away. The unit had everything we wanted and very comfortable. We will definitely stay here again next year. Very conveniently located just across from the beach and walking distance to shops, cafes and restaurants. It is close to the main road but we didn't have any problems with noise. The apartment was clean and comfortable and the staff were all friendly and helpful. Lynne at reception is so sweet. Cleanest apartment I have stayed in. Other guests polite and quiet. Thanks so much. One bedroom apartment with everything needed for a week stay including kitchen and laundry. Clean and well-appointed. Very close to beach and local amenities. Outstanding management who could not be more helpful. Consistent with all good reviews. We stayed for 3 nights in a 1st floor apartment, which was spacious and well maintained. 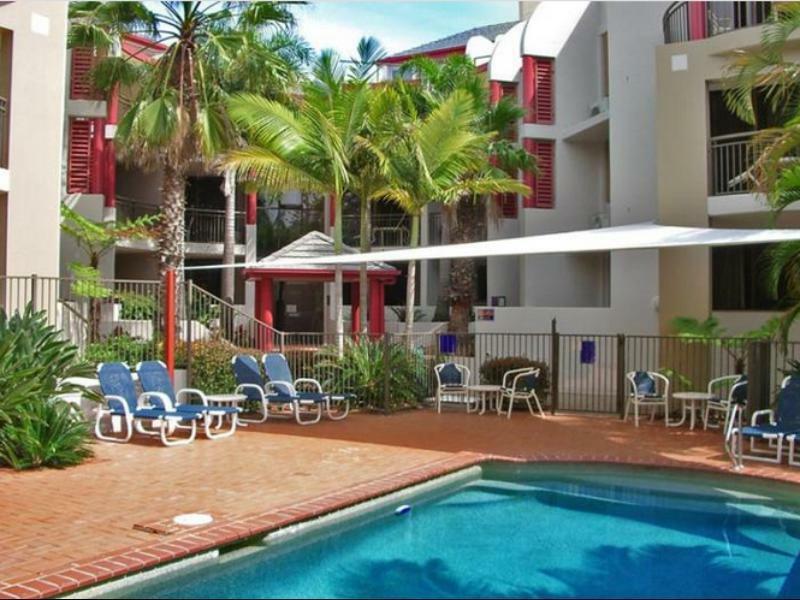 Good pool and parking and a short stroll to the beach and shops. Helpful staff and relaxed atmosphere. Will definitely return. Small unit on the GC highway but close to the beautiful Burleigh Beach. Some good deals on agoda make this a value option. Stayed for 5 nights. Kitchen complete but small. Had a terrace. Secure unercover parking. A well appointed unit in a small complex. Helpful proprietor. Short stroll to the beach. 10 minute stroll to the main shopping precinct.